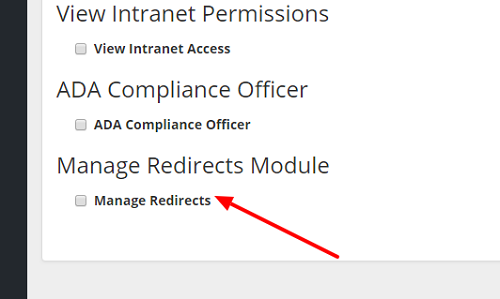 We have added a new feature that will allow you to maintain your own redirects on your website. 1. If you have permission to the Security Module you will need to search the user you would like to have this new permission. 1. Once you have given that person this permission you will now see on the left side options Manage Site Redirects. Enter the incoming URL (this will be /name) This is what your want the shortened URL to be show as for your end user to click on. Redirect URL is the actual website you want them to end up being at. You must enter www. for this to accept the URL. 3. Once you have saved your redirect you will then see this below. You will see the little hourglass and the line is in yellow that will show till the redirect has taken effect. This usually takes about 5 minutes for this to process. Once it is active the hourglass will go away and the yellowish bar will turn white.